With qPCR primers for a carefully curated set of mRNA, miRNA, and lncRNA neural differentiation markers and SBI’s sensitive and reliable RNA-Quant™ cDNA Synthesis Kit, our Neural Lineage qPCR Profiler simplifies your neural development and lineage studies. The Neural Lineage qPCR Profiler is a comprehensive system for characterizing the different stages of human neural development, and discriminating between terminally differentiated neural cell types. The system can simultaneously quantitate relative expression level differences between two or more samples for 95 separate markers. 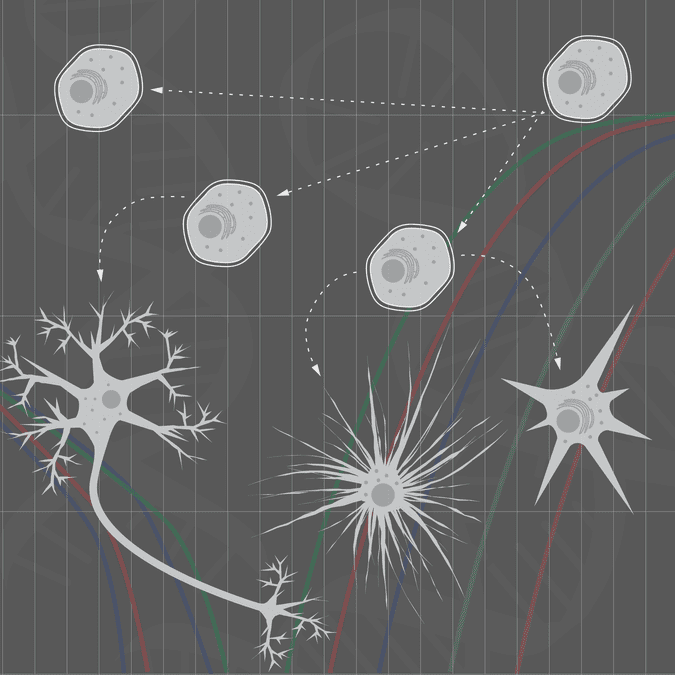 All markers included in the qPCR Profiler have been carefully selected from the published literature for their roles in neural differentiation or cell-specific expression in different types of neural cells, and all primers have been validated using RNAs from relevant tissues, including human fetal brain, human adult brain, iPSCs, neural precursor cells, and medulla oblongata. Primers for mRNAs and lncRNAs were designed using sequence information from NCBI and were verified to possess no significant homology to off-target sequences or known murine sequences. Each mRNA and lncRNA primer set amplifies a DNA segment of 100 – 120 nucleotides (nt) in length. For mature miRNAs in the 19-24 nt size range, the forward primer consists of the target miRNA sequence (obtained from miRbase) paired with SBI’s proprietary universal reverse primer, which is homologous to the adapter of the anchored oligo-dT that is added by the RNA-Quant Kit. Figure 1. The Neural Lineage qPCR Profiler assays are highly specific. Individual primer set assays using the Neural Lineage qPCR Profiler on total RNA isolated from neuronal tissue show a single peak during dissociation melt curve analysis, demonstrating the high specificity of the kit. Figure 2. The Neural Lineage qPCR Profiler can identify pluripotency. Analysis of total RNA derived from adult human brain cells, medulla oblongata cells, fetal human brain cells, and iPSCs using the pluripotency markers Oct4, Nanog, Klf4 and c-Myc from the Neural Lineage qPCR Profiler only show strong signal for the less differentiated tissues, as expected. Figure 3. The Neural Lineage qPCR Profiler easily distinguishes iPSCs, neural stem cells, and differentiated neurons. Figure 4. The Neural Lineage qPCR Profiler distinguishes neuronal lineages. NCAM (Neural Cell Adhesion Molecule) is a neural precursor marker, ALDOC (Aldolase C, Fructose-Bisphosphate) is a marker for astrocytes, miR-133b is a marker for dopaminergic neurons, and NSE (Neuron Specific Enolase) is a marker for oligodendrocytes.